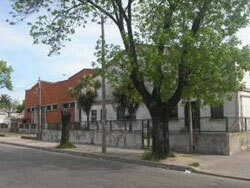 The working class district of Villa Española is only 45 minutes from downtown Montevideo. Its primary industry was rubber production, because of the construction of the Fabrica Uruguaya de Neumaticos SA tire plant in 1935. Other famous sites of interest in Villa Española are the Social Club, the Sport Spanish Villa, and the Cilindro Municipal, which crosses the Avenida Dámaso Larrañaga.